The mineralized sites form the SW extension of the rusted gold-mineralized Biblain showing identified 1 km away by the MRNQ (3.0 g/t Au; Leclair et al., 1998). Stelmine geologists visited more than 38 sites and collected 22 grab samples during a 5 day heliborne campaign completed during September 2018. The mineralized zones constitute sulfurized and oxidized metasedimentary sequences (2-10 %; mainly pyrrhotite±pyrite) within amphibolite-rich (grunerite) and garnet-rich layers possibly forming iron formations. The Mercator property is located within the extension of the Opinaca metasedimentary sub-province just south of the western segment of the Ashuanipi sub-province and east of the contact with the La Grande sub-province. Most metasedimentary rocks are constituted of greywackes, arenites, siltstones and iron formations (mostly chert). The rocks are highly metamorphosed and migmatized and are largely represented by paragneiss some of which may be dioritic gneiss. The rocks probably belong to the Hublet Group (Mercator Fm). The main plutonic rocks are constituted of migmatized tonalites revealing 15-35 felsic mobilizates of granitic composition (Figure 1). Stelmine also discloses the issuance, as of February 12, 2019, of a total of 850 000 stock options granted according to the Company’s Option Plan. 700,000 options were granted to directors, executive officers and employee for a period of 5 years. The Company also allocated 150,000 options to a consultant for a period of 1 year. All options are issued at the grant date at an exercise price of 0.15$ and each option may be exercised during each period specified above from the grant date. Subject to approval of the TSX Venture Exchange. Stelmine is proud to announce the nomination of Julie Lemieux as the Company’s CFO. Ms. Lemieux has been working in the accounting field for more than 22 years. She has been a controller at the company since last year. Previously, she acted for various private companies as a controller and worked for over 5 years at a public company where she gained the experience that adds value to Stelmine. Furthermore, Stelmine announces the resignation of Mr. Paul-André Lemieux, CPA, CA. The Company expresses his gratitude for his implication and meticulous work. Stelmine implemented a strict QA/QC protocol in processing all rock samples collected from the Mercator property. The protocol included the insertion and monitoring of appropriate reference materials, in this case high concentration (OREAS-210) and low concentration (OREAS-252) certified gold standards, blanks and duplicates, to validate the accuracy and precision of the assay results. All collected rock samples were put in sturdy plastic bags, tagged and sealed in the field under the supervision of professional geologists. The sample bags were then put in rice pouches and kept securely in a field tent before being sent by floatplane to the city of Wabush. Transport to Actlabs laboratories in Ancaster, Ontario was made by truck from reliable transport companies. Gold was analyzed by fire assay method (Au-FA_ICP) and other trace metals via TD-MS or TD-ICP methods (ME-MS61). The technical contents of this release were approved by Michel Boily, PhD, geo; a Qualified Person (QP) as defined by National Instrument 43-101. Follow us on www.Stelmine.com and on our Facebook page (Stelmine Canada) where we uploaded pictures of the Courcy camp and of our crew at work. 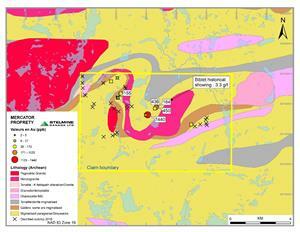 Stelmine is a junior mining exploration company which concentrates its activities in the Province of Québec. Stelmine holds 955 claims spanning 497 km2 on the eastern part of the Opinaca metasedimentary basin, which contains zones with a high potential for gold deposit discovery in geological contexts similar to the one leading to discovery of the Éléonore Mine. Its capital stock consists of 29,648,645 issued and outstanding shares for a current market capitalization of $3.5 million. The statements set forth in this press release, which describes Stelmine’s objectives, projections, estimates, expectations or forecasts, may constitute forward-looking statements within the meaning of security legislation. Positive or negative verbs such as “believe”, “can”, “shall”, “intend”, “expect”, “estimate”, “assume” and other related expressions are used to identify such statements. Stelmine wishes to state that, by their very nature, forward-looking statements involve risks and uncertainties such that its results, or the measures it adopts, could differ materially from those indicated or underlying these statements or could have an impact on the degree of realization of a particular projection. Major factors that may lead to a material difference between Stelmine’s actual results and the projections or expectations set forth in the forward-looking statement include the risk that the Company does not complete the Placement as anticipated, and such other risks as described in detail from time to time in the reports filed by Stelmine with security authorities in Canada. Unless otherwise required by applicable securities laws, Stelmine disclaims any intention or obligation to update or revise any forward-looking statements, whether as a result of the new information, future events or otherwise. The forward-looking information in this release is based on information available as of the date of this release.